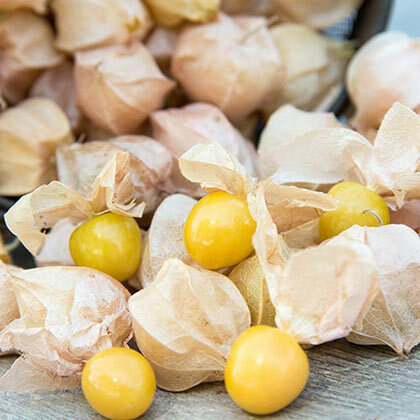 One of the tastiest ground cherries we've grown! 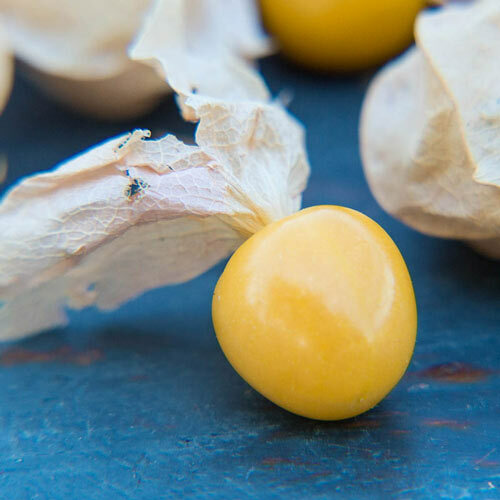 Small yellow fruits have a popping crisp texture and a sweet-tart flavor with hints of citrus and pineapple. They're great for snacking, chopped up into salsas and cooked into jams, preserves and pie fillings. Aunt Molly's is an extremely productive, heirloom variety that has been a favorite among Pennsylvania Dutch growers since the 1830s. The fruits are covered in a papery husk and drop to the ground when ripe. The harvested fruits hold up in the husk for 3-4 weeks. 75-90 DAYS. FruitSmall yellow fruit with citrus/pineapple flavor. 1/2 - 34 inch fruits. Seed CountApproximately 50 seedss per packet. CommentsA unique flavor described as citrus or pineapple, Aunt Molly is extremely productive and harvested fruit holds up in the husk for 3-4 weeks in cool, dry conditions. Popular in our research garden, it's been grown by the Pennsylvania Dutch since the 1830's.